At my house, I always like to make diverse recipes from different cuisines and cultures. Tonight it just happened to be Vietnamese. I basically love all asian foods and dream to someday travel to Asia and delve into the street food scene where I could really taste the authentic stuff straight from the locals while experiencing all the sights and sounds around me. I stumbled upon making this recipe by what I remember this dish tasting like back home on Guam. Where I'm from, it's a melting pot of all types of cuisine, so I had the pleasure of enjoying so much of it and being so spoiled! Now that I am in the mainland, it's harder to come by those tastes that I was so used to back home. I've had to learn how to make the dishes that I love, so I am grateful that there are a few asian markets here where I can find almost anything I need. Lemongrass Chicken can be found at most Vietnamese and/or asian restaurants. The lemongrass gives it a beautiful aroma and mild taste. The star here, though, is the red pepper powder. It has a mild taste, so you can easily control the heat. 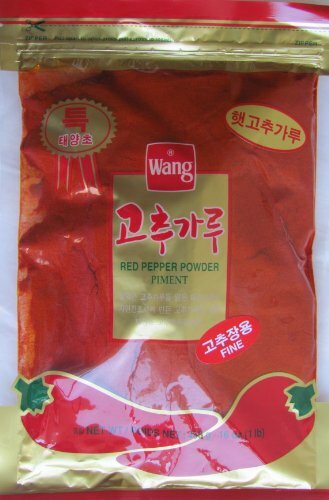 Korean pepper powder can be found at most asian markets, but make sure to purchase the right one, as there are different types available that look the same, but aren't. I include links below to the asian ingredients that you may not find locally. Let's get started! Chop chicken thighs into 1"x 1" cubes. Cut lemongrass at a diagonal into 2" pieces. On medium high heat, in a wok, add olive oil and lemongrass and saute until arromatic and slightly browned. Add chicken and sprinkle with salt and pepper. Let the chicken cook without constantly turning it, so it can get nicely browned, about 5 minutes on each side before flipping. Do this for each side until all sides are nicely browned and carmelized. Add onions and saute for 2 minutes, then add fish sauce and cook for another 2 minutes. Add red pepper powder and stir to evenly coat the chicken. Cook for 2 minutes. Turn off heat and sprinkle green onions on top and combine. Enjoy with steamed, whit rice. Easy, huh? This recipe can be whipped up in no time and tastes just like restaurant quality. If you like things on the spicier side, just add more pepper powder. I hope you can try it out!